Lisa Pressman, an American abstract painter, was born in Elizabeth, New Jersey in 1958. She earned a BA in Art from Douglass College of Rutgers University and an MFA from Bard College. Recent exhibitions include Susan Eley Fine Arts in New York, NY; Addington Gallery in Chicago, IL; and Circa Gallery in Minneapolis. Others include: The Hunterdon Art Museum in Clinton NJ; The Cape Cod Museum of Fine Arts in Dennis, MA; and OTA Contemporary in Santa Fe, NM. In 2020 Lisa will be having a solo show at the Mulvane Art Museum in Topeka, KS. 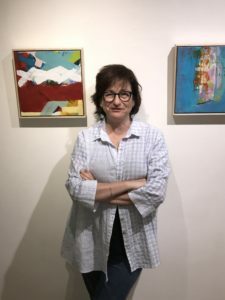 Her work has been exhibited extensively throughout the U.S. and abroad. Numerous private and public collections feature her paintings. > > These pieces are available now at The Tenth Muse — please call us at 973.313.2722 if you are interested in purchasing. Thank you!